Harlan Ranch Real Estate Resort-style living with easy access to the great outdoors. 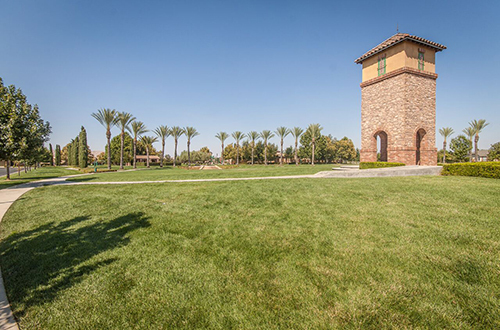 Harlan Ranch is a vibrant, master-planned community located in the city of Clovis, CA. 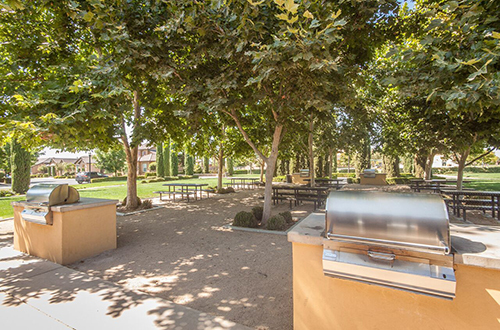 This resort-style neighborhood is designed to encourage residents to enjoy the outdoors, whether walking on the meandering tree-lined paths, picnicking at a lush park, or playing with the kids at the pool while relaxing at The Resort at Harlan Ranch. Featuring homes for first-time homebuyers, growing families, empty nesters and everyone in between, Harlan Ranch is certain to create a diverse community with all of the style and sophistication you’ve come to expect from the renowned local homebuilders Wathen-Castanos, Inc. and Wilson Homes. Harlan Ranch is their vision- a vision inspired by the spirit of a time built on values, respect and community. At Harlan Ranch, you’ll find a variety of homes designed with a variety of different lifestyles in mind, while all keeping within the spirit of the community. Whether you’re downsizing and looking for a smaller, intimate home or looking for plenty of space to accommodate your growing family, you’re sure to find the perfect, luxurious and relaxing home for you at Harlan Ranch. From Barclay Square, a gated community with Old-World, European style and private, easily-maintained backyards to Capri Court, which combines the ease of modern living and green design with contemporary elegance, to Legacy, a new and exclusive neighborhood featuring estate sized lots and designer finishes, just to name a few, Harlan Ranch offers communities that cater to every personality and stage of life. Harlan Ranch is located in the northeastern part of the Fresno/Clovis metropolitan area. Located within the city of Clovis, the triangularly-shaped property is approximately 400 acres. Roadways binding the property provide regional access, including Shepherd Avenue along the north, Highway 168 along the southeast and DeWolf Avenue to the west. Harlan Ranch is conveniently located just miles from downtown Clovis, the Sierras, and Huntington and Shaver Lakes. 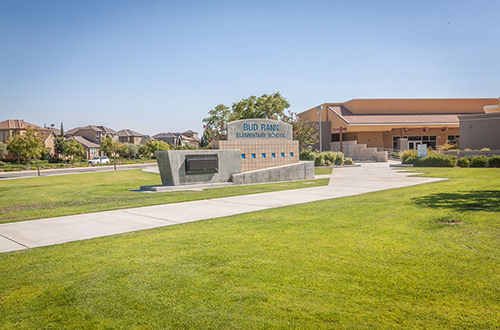 At Harlan Ranch, you’ll find eleven lush neighborhood parks, a Junior Olympic sized swimming pool, a Community Recreation Center, an amphitheater, a rock climbing wall, tree-lined paseos, parks with playgrounds, picnic areas and numerous other features and attractions. 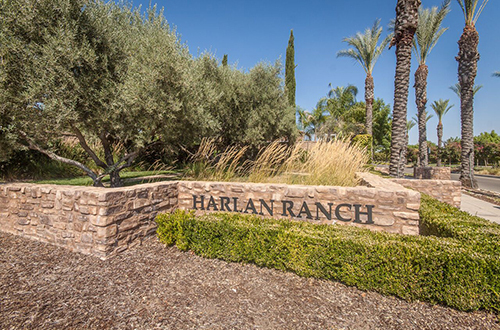 Living at Harlan Ranch is like waking up everyday in a self-contained oasis of peaceful relaxation. When residents do feel like exploring outside of the oasis of Harlan Ranch, they have plenty of world class activities and destinations to choose from. Within minutes residents can be shopping or dining at Sierra Vista Mall or viewing a blockbuster movie at Sierra Vista Cinemas or the newly-opened Maya Cinemas. Nearby Old Town Clovis offers unique local shopping and dining options as well as exciting family events like the Clovis Rodeo, Farmers Market Fridays and Big Hat Days. Our friends who live at Harlan Ranch enjoy driving down Shepherd to eat at highly-rated local restaurants like Yosemite Ranch, Five Restaurant and Campagnia Bistro. In less than an hour’s drive, Harlan Ranch residents can find themselves hiking in the Sierras or boating and fishing at picturesque Shaver and Huntington Lakes. During the winter, local snow parks and skiing at China Peak are also just a short drive away. And in the midst of a hot Central Valley summer, who wouldn’t enjoy such easy access to fresh mountain air? Want to learn more about Harlan Ranch? If you’re looking to explore the real estate market of Harlan Ranch, or the greater Clovis or Fresno area, our team of local experts at Raymer Realty Group would be more than happy to guide you around the area and maybe even help you find the perfect home. Contact one of our agents!